I created a cute favor bag using the newest Little Dog Agenda stamps and dies as the stars. I had cut out a whole bunch of the Little Dog from a different project and wanted to use the new Fringe dies in a fun way. At first I was going for a Cinco de Mayo theme project, but decided to go full Spring with the pastel colors! I just love those little dogs! I love this entire release! Mama Elephant has the cutest stamps ever!! I love the Little Dog Agenda!! Love the adorable new releases! I'm definitely going to need to pick up a few goodies! Can't wait to get my order. Love the usr of the fringes here. Those are too cute!! I currently don't have any of your products but will def. be checking into them! From what I've seen, they're awesome! I love how you used the little guys to decorate a bag. I like to find a lot of uses for my stamps, too. SO cute. Following, and commented on Instagram. I hope that I did it properly. I am brand new to Instagram, and am clueless! Adorable way to use the fringe! I love those doggies! Absolutely love this! I follow on Facebook and Instagram. Amazing release. Want to have them all. Omg!! I love it! Going go get all those cat agenda dies! I love the little dogs! And what a great tip for labeling the matching dies. So far every blog hop project has been my favorite! Great release! Cute as can be! Love those adorable pups! The DT did a wonderful job with the stamps. The new releases are so cute! I need them!! Oh my goodness, so SUPER cute!! Another amazing release!! So excited for the cat dies and also the adorable dog stamps and dies now too!!! The bag is so adorable and I'm loving the fringe die!! So many beautiful things in this release - I love those peonies! this was a fabby release. love it all! Amazing release ME! I love the Lafayette Die set and Sticky Notes stamp sets! You have once again AMAZED me! I absolutely love Mama Elephant products and would love to see a paper line matching the ink colors! The DT and GD did a fabulous job on showcasing this release. Great new sets! Oh my goodness!! This is TOO CUTE!!! I love the images and the fun way they are arranged on the bag!! I left a comment on FB. I am already a follower!! I am a follower on instagram (hobbitnoll) and left a comment. I am head-over-heels in love with both the new dog set and the peony set. I am so in love with the Little Dog Agenda stamps and dies!!! oh how cute those tiny dogs are! I think I finally completed all 4 requirements for the 4 entries. Facebook (Samantha Stevens) - I liked your page, the post, commented and shared it. Twitter (Good~Griefous @Samanth25577317) - liked your page, your post, commented and retweeted. Instagram (good.grief.yall) - I am following you, commented & liked your post. Fabulous release , can't wait to get my hands on them ! LOVE LOVE LOVE this new release!!! I am SO excited for the little cat dies to match thr stamps!!!! Love these super cute dogs! eek! all the cuteness of a dog and none of the mess... I need these! So many cute new items!! So much cuteness, oh my goodness! look on it, so cute! So cute! Love the cats too! Now the cats in my planner pages can have little dog companions. Super cute! Can't wait to get the dog stamp agenda!! Oh my gosh! I LOVE this release! Gotta get my paws on all those CUTE PUPPIES!! Love the little dogs - I've been really enjoying seeing how this set has been used in the last few days! Cute, cute, cute. Love those little doggies. So much fun! Thanks ME!! As a dog lover, of course, the doggies are my favorite from this release. Way too cute! Who wouldn't want to send or receive a card with any of these stamps on it! Congratulations Mama Elephant. Those dogs are to cute! This release is so cute! Love those wee little animals. Thank you for the continued magic and inspiration! Those pups are the cutest. I love this release--there is both cute and elegant!! I love the Sticky Notes stamp set! Perfect for Lunch Box Love Notes! Love this favor bag and the dogs are so sweet! Love the dog agenda to go with my cat agenda! Love mama elephant and I cannot wait to get the little doggy agenda set! Super cute!!!!!! I might have to stay on schedule now that I have doggies to remind me! I follow you on Facebook! I think we are supposed to state that here too. And instagram - where I get most of my info. I follow you there all the time for sure!!!!!! I love the little dogs stamp set! The doggie agenda is so cute. Love what you did with it. Great release. I want it all! I love these puppies! They are so cute! Have the kitty agenda, need that doggie agenda so cute! Such lovely stamps!They make me smile! What a sweet card! Love all those wonderful critters! Your little critters always make me smile!!! Visited and shared the release on fb. I love the "Sticky Note" stamps! Those little guys are just too adorable! The dog agenda set is just the perfect match with the cat agenda! I also can't wait for those cat dies! I also follow y'all on Facebook! Ohh it's so cute. 😊 💟 Following on Facebook and Instagram already. Love the new release, happy to see dogs along with the cats! Love the release. The little dogs are so cute! darling release and the Little Doggies are stinking cute! I am loving the mini animals , I love that you guys have made the mini cat dies! makes it so easy! I love dogs and I especially love this set! SO cute! The dog stamps are delightful! Very cute! Thanks for the inspiration and for the opportunity to win! awww so cute! love the spring colors! 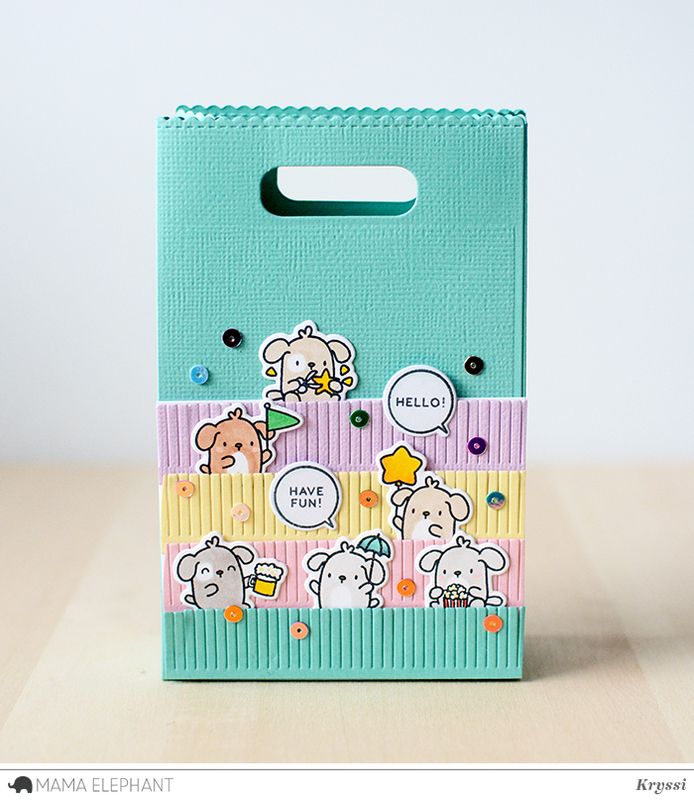 Really cute release and I adore those doggies and post it note set. I like you already on FB. I love the mix of elegant and cute! Lovely new products! Super sweet favor bag! cutest favor bag ever! congrats on this new release. it's amazing! Oh, this is so cute! Love the Little Dog Agenda stamps! What a great release. Thanks for all the inspiration. Such a cute way to showcase the Little Dogs! Perfect at a spring ballgame! The little peeking animals in the planner stamp set are my favorite in this release. Have a nice day! I think the rock star sentiment is my favorite. That set is my fav. Super Cute bag!!! I love how you used the fringe die!!! Adorable with the doggies and I like these colors. I am also an Instagram follower - Love seeing Mama Elephant goodies pop up in my Insta Feed! love the new planner stamps- too cute! The dog agenda set is as cute as the cat agenda stamps. Love that there are dies for each.